Rising employment, an improvement in consumer confidence and a thaw in lending are facilitating the revival in sales of cars and light-duty trucks. WASHINGTON (Bloomberg) -- Car sales that are running at the fastest pace in four years are poised to reverberate through the world’s largest economy as a spillover into production, profits and jobs for Americans may be starting. Auto purchases have exceeded a 14 million annual rate in each month this year, the strongest performance since early 2008, according to the Automotive News data center. Government data show motor-vehicle output contributed half of the first quarter’s 2.2 percent economic growth. General Motors Co. boosted its 2012 industry-sales forecast, Ford Motor Co. will add factory shifts and Chrysler Group LLC is stepping up hiring as demand rises. The resurgence -- from assembly lines and dealerships to steelmakers, freight lines and loan providers -- signals the U.S. is headed for lasting, robust growth, says Joseph Carson, director of global economic research at AllianceBernstein LP in New York. Rising employment, an improvement in consumer confidence and a thaw in lending are facilitating the revival in sales of cars and light-duty trucks. Chad Moutray, chief economist at the National Association of Manufacturers in Washington, estimates each dollar spent in the industry triggers an additional $2.02 of output in the economy. Apex Tool & Manufacturing Inc. is benefiting from the trickle-down, as the maker of tooling, fixtures and gauges to manufacture glass and other products has seen an increase in auto-related sales since the last quarter of 2011. The industry rebound helps President Barack Obama as he seeks re-election in November, because his campaign “can make a plausible case this didn’t happen just by coincidence but as a direct effect of a series of actions the president took,” said Dan Schnur, a campaign adviser for Arizona Republican John McCain’s 2000 bid for the White House. The current Republican candidate, Mitt Romney, has criticized Obama for giving GM and Chrysler billions in restructuring aid, even as Romney claims he influenced Obama’s decision to rescue the two companies. Automakers have rebounded since demand plunged during the 18-month recession that began in December 2007, causing production cuts and mass layoffs, and forcing GM and Chrysler into bankruptcy in 2009. The industry’s share of gross domestic product dropped to 1.8 percent that year; the 2.8 percent for this year’s first quarter was almost back to 2007’s 2.9 percent, Carson said. Fewer discounts and better prices for new models, especially in North America, helped to bolster GM’s first-quarter earnings, the company said May 3. The company’s sales climbed even as it spent 11 percent less per vehicle on incentives, according to researcher Autodata Corp.
“This is a solid quarter,” GM’s Chief Financial Officer Dan Ammann told reporters. “Revenue growth, profit growth, margin growth, cash-flow improvement, another step in the right direction.” Second- and third-quarter results for North America should be similar to the first three months of 2012, he predicted. 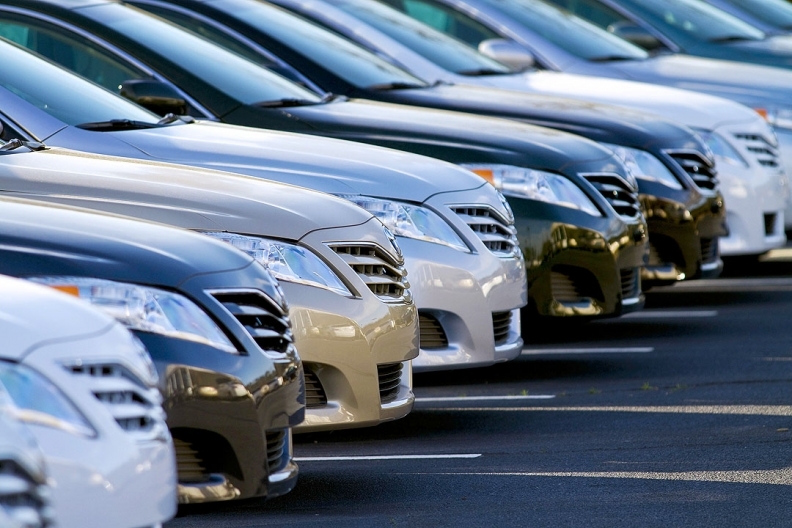 Cars and light-duty trucks sold at a 14.4 million seasonally adjusted annual rate in April, after a 14.36 million pace in March, according to the Automotive News data center. GM, Toyota and Ford all have raised projections for 2012 U.S. industry sales, and analysts surveyed by Bloomberg predict a 14.3 million total for the year, up from a January forecast of 13.6 million. The companies, in “good shape” after having survived the crisis, will improve further as Americans feel encouraged to buy big-ticket items and factories fill orders, Magliano said. GM regained its rank as global industry sales leader last year after losing it to Toyota Motor Corp. in 2008. Chrysler is accelerating plans to increase output at a sport-utility-vehicle plant in Detroit, hiring 1,100 workers in November instead of early 2013. South Korea’s Hyundai Motor Co. and Ford also will add shifts at U.S. factories this year, and Ford will idle 13 facilities for one week instead of two during its annual summer shutdown. Foreign companies also are responding to rising demand. This week Subaru announced an expansion to capacity at its Lafayette, Ind., assembly plant and Toyota Motor Corp. said it would increase production capability of V6 engines at its plant in Alabama. Toyota, the biggest seller of hybrid vehicles, also said last week it wants to boost supplies of its Prius line as demand outpaces its initial U.S. target of more than 220,000 this year. Toyota further announced it will spend about $30 million to lift output of four-cylinder engines at its Georgetown, Kentucky, plant by August 2013, adding about 80 jobs. All this means more orders for American machinery and equipment makers and is bolstering U.S. manufacturing, which grew in April at the fastest pace in almost a year, according to the Institute for Supply Management. One reason factories may remain a source of strength for the economy is low stockpiles, particularly of automobiles, said Conrad DeQuadros, senior economist and partner at RDQ Economics LLC in New York. The inventory-to-sales ratio for motor vehicles -- at 1.88 in February, the most recent government data -- is holding around last year’s average of 1.87 and is down from 2.39 in 2008, the peak since records began in 1967, he said. The gains depend on continued improvement in employment, which “provide an important support to consumer spending, including autos,” he said. The jobless rate has been above 8 percent for more than three years, and payrolls rose by 115,000 in April, the fewest in six months, after a 154,000 gain in March, adding to concerns the labor market may be faltering. Even if the industry’s rebound continues, sales haven’t returned to the pre-recession pace of 16.1 million in 2007, and its share of GDP is well below the record 4.8 percent in 1968. “We still have a ways to go, but there’s progress,” Magliano said. The ripple effect is apparent across industries. 3M Co., which makes Post-it Notes and fuel-system tune-up kits, beat analysts’ first-quarter profit estimates as U.S. auto and industrial demand cushioned slowing growth abroad. Harman International Industries Inc., a maker of car-audio systems, got a record $2 billion contract in April from a luxury European automaker whose name it didn’t disclose. Rising sales are helping generate the most business for railroads in four years, reflected in data from companies including Union Pacific Corp. and Norfolk Southern Corp. that show motor-vehicle shipments for the final week of March at the highest level since June 2008. Some companies are acquiring facilities to take advantage of the opportunities. Faurecia SA, Europe’s largest maker of car interiors, said May 3 that it will acquire an interior-components business in Saline, Mich., for an undisclosed amount to increase its U.S. market share. The business generates $1.1 billion in annual sales from cockpit modules, instrument panels, door panels and center consoles for vehicles assembled at Ford plants, the Nanterre, France-based company said, adding that Ford will become its third-largest customer.